Mix one scoop (100g) in 300-500ml water or faveourite milk. Then blend shake or stir for 20-30 seconds or until powder is disolved. Total Science Extreme Mass is the ultimate premium lean mass gainer, tested for strength, composition and purity to create a mass gainer you can rely on. Designed for any individual that has difficulties adding size, is in their bulking phase and/or wants to break the barriers of their strength plateau. 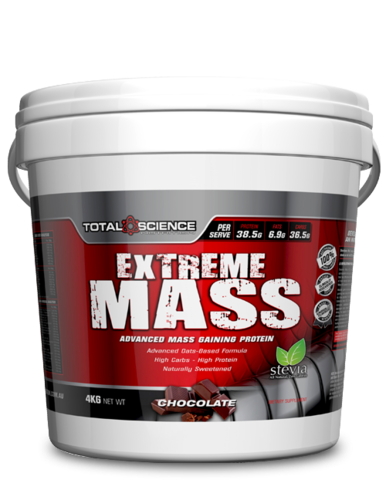 In addition to your nutritious meals and weight training Total Science Extreme Mass provides the body with premium macros to support optimal muscle growth. Muscle gains are created via substantial training and extra calories, but when it comes to gaining lean mass, not all calories are created equally. For the human body to perform at its max potential, it must be provided with a vast and complex array of vital nutrients. Total Science Extreme Mass is formulated with a precise blend of quality time release proteins, complex carbohydrates to restore the muscle glycogen, milled oats, creatine for muscle growth, fiber to delay the digestion of carbs and assist in reducing dreaded insulin spikes, glutamine for muscle recovery and a complete vitamin and mineral mix for optimised bodily functions as well as an impressive amino acid profile for optimal health.